Q: Why do kids have behavioral meltdowns and tantrums? What goes on in a child’s mind that makes him come unglued? Kids have meltdowns and temper tantrums for two reasons. The first reason is that they have never learned how to manage or have run out of the tools it takes to manage their feelings in a new situation or event. The second reason they have tantrums is because it’s been successful for them in the past. They’ve seen that when they have a tantrum, they get what they want pretty quickly. It’s all about learning and developing coping skills from day one with children. Here’s why. If a child is confronted with a situation that he hasn’t learned how to manage yet, his response is fight or flight. It’s a survival response. Very often, they can’t get out of the situation. It may be at the mall, in the car or at grandma’s house. If they can’t flee the situation, then they fight, and the way that they fight is by acting out or having a meltdown. If the parents don’t respond in an effective way, the child learns that having a meltdown or a temper tantrum will help him accomplish a goal. When a child is in a stressful situation, has a tantrum and the parent gives in to him, that’s as far as he needs to go. He won’t have to learn how to be patient, manage his anxiety and deal with stress. He just has to act out so that his parent takes care of all that. This is a skill that children learn. It’s not because they’re bad kids or good kids. It’s simply what works for them. They learn a problem-solving skill that says “If I’m disruptive to other people, then it solves my problem.” The child doesn’t have to deal with the stress because everyone else is busy running around trying to calm him down and they eventually give in to him. Tantrums are to be expected, but they’re not to be rewarded. Parents develop a range of often ineffective ways of responding to and trying to manage the child’s behavioral meltdown. They’ll either go to one extreme and scream, yell, threaten, restrain, grab or spank the child. Or they go to the other extreme: they give in. The parent solves the problem, but not through the most effective means. In my experience, parents are very resistant to the idea of their kids being unhappy or uncomfortable. They learn what their child has taught them: if you make me uncomfortable, I’m going to make you uncomfortable. When a child throws a tantrum at the mall and kicks and screams on the floor, in effect, he’s saying, “You have more to lose than me.” You do have more to lose. You’re embarrassed. You can’t accomplish your goal of shopping in the mall. People are looking at you. You feel like a bad parent, and you think everyone around you considers you a bad parent. The kid has nothing to lose and everything to gain. He doesn’t care what people think. He just wants to control you and get an ice cream cone. Inadvertently, parents teach kids that meltdowns work, and as long as something works, it’s human nature not to change it. I think that if meltdowns work for a child, you’ll see them continue. But as the child gets older, meltdowns will start to look like abusive or intimidating behavior. It’s a tantrum at age 5. At age 15, it’s breaking things around the house, threatening physical violence and using abusive language. So those childhood meltdowns become very serious things. 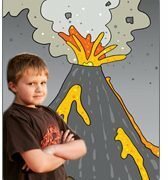 Q: Are tantrums to be expected…or even accepted in children and adolescents? Is it just something they naturally go through? Children are going to get overwhelmed, frustrated, angry and have temper tantrums. The way parents manage that will determine the frequency and intensity of the meltdown. Can we stop meltdowns? Absolutely not. This is a part of childhood development. This is how they get out some very painful or confusing feelings. But can we manage their frequency and can we manage their intensity? Absolutely. It all depends on how we respond to them. Tantrums are to be expected, but they’re not to be rewarded. You have to set limits with your child, and teach him the skills to manage overwhelming feelings on his own. If you don’t set up a situation where the child has to learn how to manage those overwhelming feelings and negative thoughts on his own, he’s never going to learn. The important thing to remember is that it’s not whether tantrums are inevitable. It’s how parents manage them that will determine their frequency and intensity. Q: So, how should a parent manage these outbursts? What’s the appropriate response for a parent to have when they see a tantrum so that they can stop the inappropriate behavior and prevent it from happening in the first place? It’s important to remember that there’s a difference between what the child learns and what the parent says. When you say something to a child, that’s not necessarily what he’s going to learn. He’s not going to learn from what you’re saying. He’s going to learn from what you’re doing. Parents often give speeches about how kids have to behave appropriately. How a certain behavior is not fair to others. How difficult it is and what’s going to happen next time. Then what the parent does is give in. Or the parent escalates their own behavior. These are natural responses, but they are ineffective. Kids learn from what parents do, not from what parents say. When you give in to a child after he acts out, then give him a speech about his behavior, you may think, “Good, I taught him a lesson. He understands now.” But the kid thinks, “Good, I got the ice cream cone. I got my way.” Or, “Good, I didn’t have to do it again.” Parents often know the right thing to say, but don’t know the right thing to do. They’re left scratching their heads saying, “I explained this to him a thousand times. I don’t know why he doesn’t understand.” He doesn’t understand because there’s something in the parent’s behavioral response that is reinforcing that behavior. It’s a payoff for the kid. And as long as he gets paid off, he’s going to keep doing it. You have to not give into the meltdown, but you have to understand it and what starts it. Step one is to identify what triggers the child’s behavior–through either you own observations, knowledge or insight, through what you can elicit from the child or what you observe in the environment. Step two is to teach the child that acting out is not the way to manage this. The key is not to listen to the excuse afterwards; it’s getting the kid to understand that when a particular thing happens, he begins to get upset. And when he begins to get upset, there are things he has to do differently in order not to lose control. “What are you going to do differently the next time this happens? I tell parents that when a meltdown happens in a store, leave the store. Explain to the child in the car before you go into the store, “Sometimes when you don’t get your way, you get upset and you yell and roll on the floor. If you do that, we’re leaving the store. I just want you to know that.” As a kid gets older, you can tell him, “I’m leaving the store, and if you resist me or fight me, I’ll be in the car. You can find me. You know where the car is.” Certainly you wouldn’t leave a four-year-old in a store, but with a nine- or a ten-year-old, you might. If they try to play the game of “you can’t make me” say, “You’re right. I can’t make you. I’m going out to the car and I’ll call the security guard and maybe they can help you out.” You’re putting the pressure back on the child to behave appropriately. Is that risky? Of course, there’s always risk. But on the other hand, it’s risky to give in over and over again. I’m not advising every parent to do this. I’m saying it’s an option and you can learn the situations for which it might be appropriate. Parents need to focus on the fact that a tantrum is a power struggle your kid is trying to have with you. It’s a strategy to try to get his way with the least amount of discomfort to him. Sometimes that means blowing up the most discomfort to the parent. Too often, parents forget that they have the power. This kid is trying to wrestle some power from you. As a parent, you hold the cards. You just have to play those cards well. Part of the hand you’re dealt has to do with your own parenting skills, your background and your natural ability. 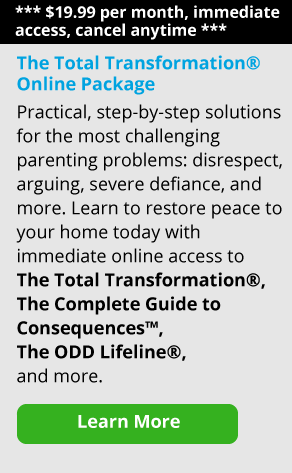 But a big part of it is how you play those cards: learning how to use your child’s natural skills and abilities, understanding their deficits, and then using your natural skills and abilities to help that child learn to manage situations and understand that acting out and misbehaving is not the way to solve the problem. Parents have this power and they can do this. I see it all the time. Believe me, the payoff to their family life and to their children is immeasurable.